Council chiefs in Leeds say more than £1.7m will be spent on repairing and preventing potholes this year, but claim it falls far short of the Government investment needed to tackle the motorists’ scourge. Leeds City Council spends around £1m a year repairing potholes and has been given a further £711,000 government cash this year for pothole patching and prevention work. Recent snowy conditions have led to an increase in potholes on roads across the country and motoring organisation the RAC says motorists face the long term consequences of broken up road surfaces for months and possibly years to come. A Leeds City Council spokesman, said: “As a council we are allocating over £1m per year to tackling highways defects, which includes as a priority, addressing those potholes in need of quick and urgent repair across Leeds. “When severe weather arrives it does have a real impact on our roads, with the result that more potholes are created. “Whilst every attempt is made to undertake work to make the potholes safe, we simply do not have the funding to carry out substantial repairs to every street. The spokesman added: “There has been an increase in the number of reported potholes due to the icy winter. Older roads and surfaces that have reached the end of their expected life are the ones which are most vulnerable to pothole formation.” The council deals with an average of 183 potholes per week with that figure rising to 260 in winter. The council said it is not possible to estimate how many potholes there are on the city’s 12,000 streets. The government has said it is giving local authorities a record £296m this winter through the pothole action fund to repair crumbling roads. 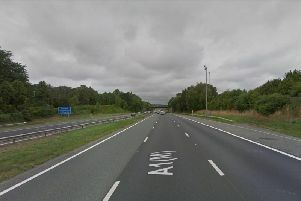 A Department for Transport spokesman told the Yorkshire Evening Post: “This Government is taking the big decisions for Britain’s future and investing a record £23 billion on our roads to improve journeys. “We know road surfaces are a concern for all road users and that is why we are providing local highway authorities in England, outside London, with just under £6 billion to help improve the condition of our local highway networks. Drivers have been flagging up problem potholes in the Leeds after an online appeal on the Yorkshire Evening Post’s Facebook page.